This high-quality sea kayak coaching weekend offers fantastic venues, great coaches, a wonderful base and welcoming atmosphere. Come join us! of a larger event. If you’re looking for great coaching in a supportive environment – with great social fun each evening – this is the weekend for you! We recommend confidence paddling in open water conditions – if you’re ready to develop moderate water sea kayaking skills (or beyond), we’re delighted to welcome you to our coaching weekends. 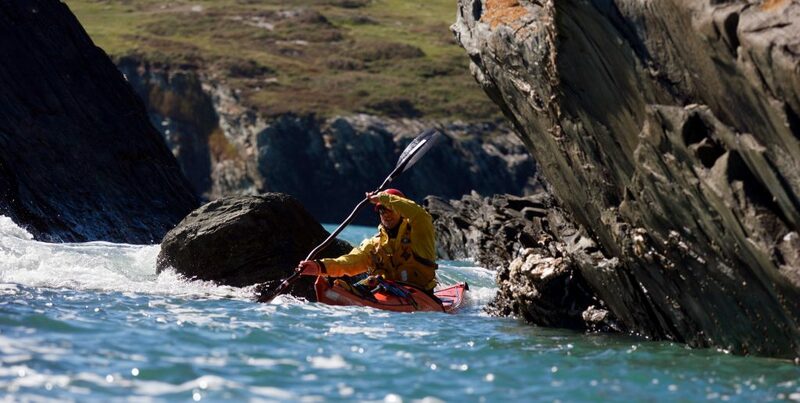 The fantastic sea kayaking environment of Anglesey, North Wales. 360 degrees of high quality coastline, tide races, rocky coves and islands, surf beaches – it’s all here! We recommend Anglesey Outdoors – www.angleseyoutdoors.com – who have private rooms, bunk house, camping and an onsite bar & catering. We will be based at Anglesey Outdoors for the weekend and will meet you there each day. We have some available pre-booked accommodation at Anglesey Outdoors – contact us directly for further information. Check out the 2019 program PDF for an overview of our planned coaching sessions. If you’re unable to paddle with us for all three days, you can join your chosen coaching sessions at a daily cost of £60. On the days you’re unable to attend, simply choose ‘No Session Selected’ on our Online Booking Form.